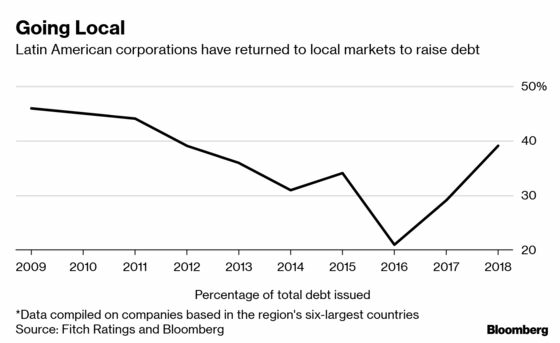 (Bloomberg) -- Latin American companies are staying home to raise money as they shift to local debt markets that are increasingly flush with cash and offering favorable interest rates. Almost 40 percent of the $140 billion in corporate bonds issued in the region last year were denominated in local currencies, the highest percentage since 2012, according to data from Fitch Ratings. Already this year, Brazilian oil giant Petrobras placed almost $1 billion worth of real-denominated bonds and Banco Santander Chile retapped the first-ever floating-rate peso bond sold in the local market. Finance chiefs slashed international debt sales almost 40 percent in 2018 as they avoided the costs of hedging against a strong U.S dollar. Locally, sales held steady as low interest rates and plentiful liquidity in Brazil and other countries led to better borrowing terms, according to Jay Djemal, the senior director of Latin America credit research at Fitch. The trend, which began with a 60 percent surge in local sales in 2017, is likely to continue, he said. “The bulk of companies are local players that generate revenue in local currency, and considering the cost of foreign-exchange hedging, the pattern will play out similarly,” he said in an interview from New York. Petrobras, as state-controlled Petroleo Brasileiro SA is known, increased the size of its January bond sale after demand was more than three times the original amount offered. The 10-year notes priced to yield less than similar-maturity notes from the government. The company will soon be followed by the power producers Centrais Eletricas Brasileiras SA, known as Eletrobras, and Cia. Energetica de Minas Gerais, known as Cemig, according to people aware of the plans. Eletrobras is said to be moving to sell as much as 4 billion reais ($1 billion) of local bonds that will be used to help pay off a $1 billion international bond maturing in July, according to the people. Cemig is said to have requested proposals from banks to sell as much as 3.5 billion reais of debt. In Chile, where rules changed two years ago to allow foreign investors to buy local bonds via Euroclear, issuers sold more peso-denominated paper than global bonds last year. It is just the second time that has happened since 2011, according to Fitch. In Colombia, a local market that has traditionally suffered with a lack of liquidity and few corporate sales, local issuance surpassed 4 trillion pesos (about $1.3 billion) in the past two years, the first time since at least 2011. Even in Argentina, home to the world’s worst-performing currency and 51 percent annual inflation, companies sold more peso-denominated bonds than foreign debt last year for the first time since 2015. Local debt sales rose 17 percent in 2018, according to the country’s securities regulator. Mexico was the exception. Local sales of corporate debt fell 29 percent last year as interest rates increased, according to Ve Por Mas, a Mexico City brokerage. Latin American companies face $23 billion in dollar-bond maturities this year, with the figure more than doubling next year and topping out at $74 billion in 2022, according to data compiled by Bloomberg. And undoubtedly, companies that get the bulk of their revenue in dollars will continue to stick with overseas markets to avoid currency mismatches. A dovish turn by the Federal Reserve, with analysts predicting no interest-rate increases this year, may also make selling dollar-denominated notes more attractive. “That creates a dollar credit opportunity for corporates to refinance some of the increase in maturities that are coming,” said Angela Hurtado, senior country officer for Colombia at JPMorgan Chase & Co. in Bogota. Banco Santander Chile has found that selling debt locally has been cheaper than going abroad, after accounting for the costs of hedging and bringing foreign currency into the country, according to Chief Financial Officer Emiliano Muratore. The company has issued almost 80 percent of its debt this year in the local market.